Yes, the title says it all…I’ve used just about every pattern possible on this, but it works. This is for the Viva La Verve Sketch Challenge for July (week two) going on over at Splitcoast. Check it out…it’s lots of fun! Love this sentiment from Verve…it’s so versatile. Would work for any tough situation a loved-one or friend is going through and the colors are sedate enough for a sympathy card but colorful enough to brighten some one’s day. Just lots of simple layering on this. The flowers have been fussy cut. One of the them has two layers and the other has three. I used my scissors to snip into the petals which allowed me to use my fingers to shape them which gives them lots of dimension. All the other stuff: Big Shot Pro, Spellbinders Circle nesties, paper crimper, paper piercer, brads, scissors, adhesive. 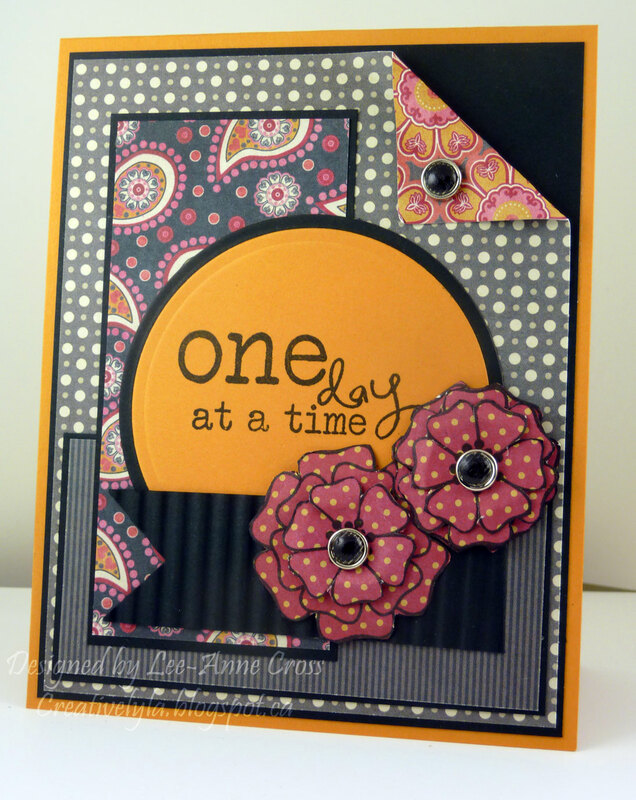 Such a lovely card and a gorgeous mix of colors and patterns.